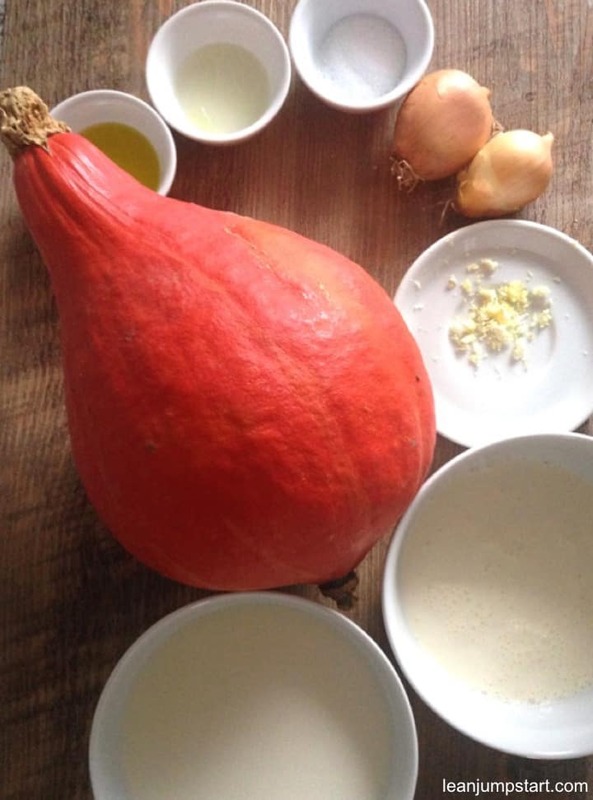 It was only some years ago when I tried for the first time the red kuri squash soup recipe I’m presenting you today. Since then it has become a clean eating soup staple for my family and me – at least in autumn/winter time. I have to admit that for most of my life squashes where only part of a colorful indoor and outdoor fall decoration. This simple, creamy soup however changed everything. Heads up! Although this vegetable is often also called “Hokkaido pumpkin” it belongs to the Hubbard squash group. Look at the picture below. Is this not the most gorgeous color you’ve ever seen in a vegetable soup? By the way its “saturated orange” comes from the beta carotene, a pre-cursor to Vitamin A that is known for its huge antioxidant power. 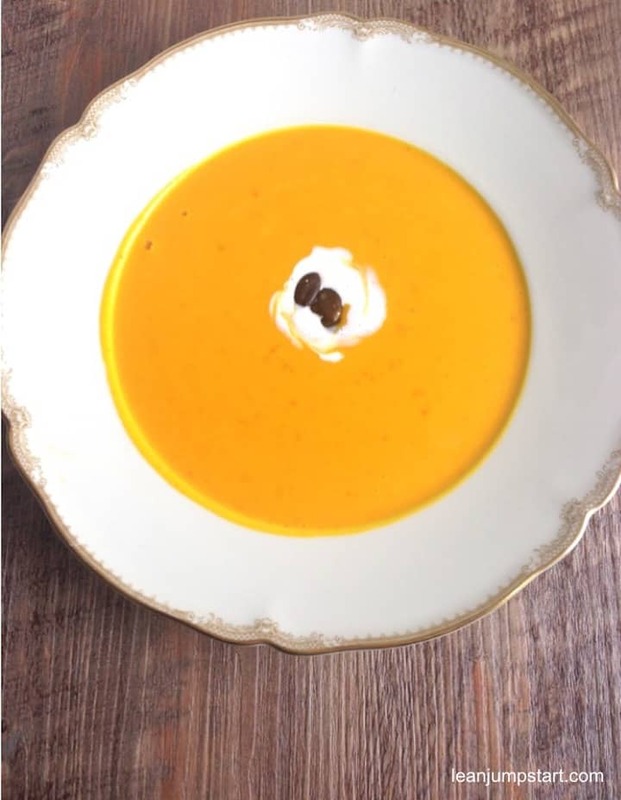 And then its taste…Nutty flavour and sweet, this squash soup is hard to resist. 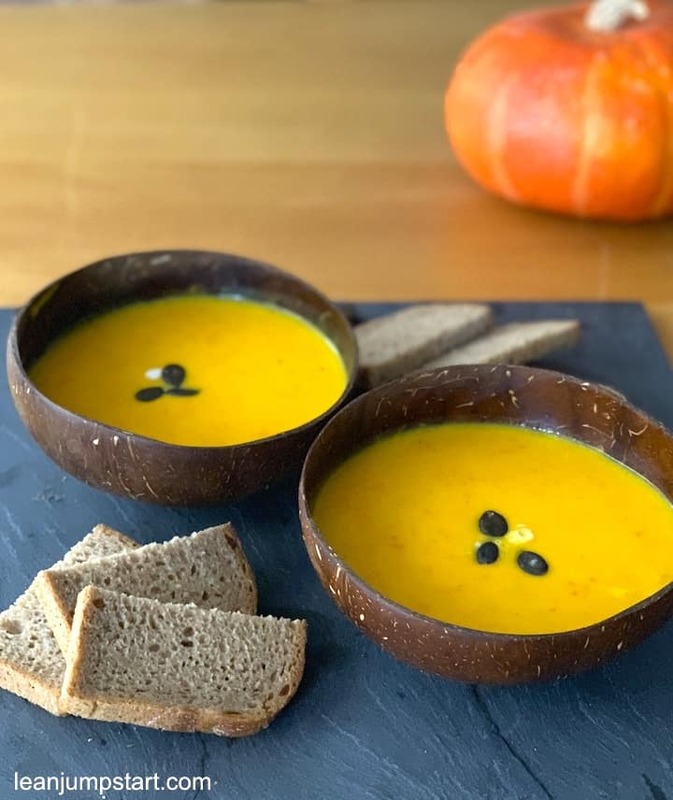 This is not only my favorite of all types of squashes but preparing it as a fall vegetable soup is also my preferred way to use it. I promise, once you’ll try this fiber rich one pot meal you will be hooked too. I love to serve it in coconut bowls with some slices of whole grain bread. Sprinkling some pumpkin seeds over the soup not only pleases the eye but increases your fiber consumption even more. Easy preparation: no need to peel it! As most of my clean eating soup recipes it is also easy to prepare and can be ready within 30 minutes. The good news about Hokkaido pumpkins is that you don’t have to peel them. The hardest part in the preparation process is to cut the veggie in two halves. Patience and a good chef’s knife should do the trick or maybe you can ask your better half for help. I’m lucky as my hubby enjoys carving pumpkins anyway. Most often he will split open the vegetable for me, deseed it and cut it into cubes. In a large saucepan or pot, sauté onions and Hokkaido pumpkin cubes in hot olive oil for three minutes, stirring occasionally. Add vegetable broth and let it come to a boil. Cover and cook about 20 minutes. Taste with lemon juice, ginger, salt and pepper. Garnish with some cream and pumpkin seeds before serving. To save animal fat you can use skim milk although I know that it is more processed and not as clean as whole milk. 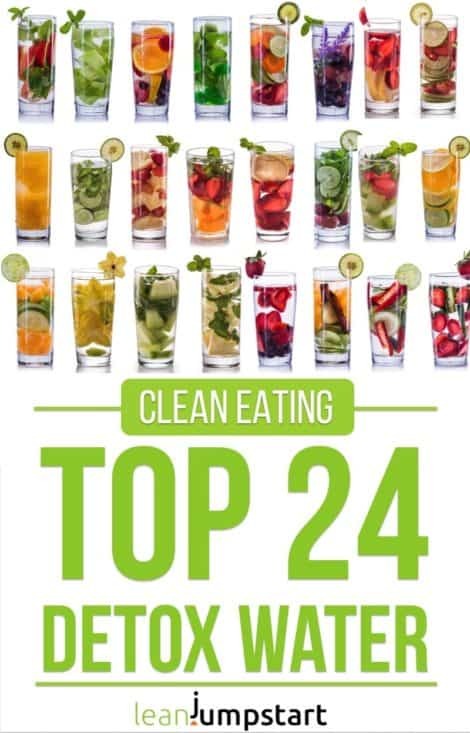 But hey, with my 80/20 approach to clean eating this is a great compromise. 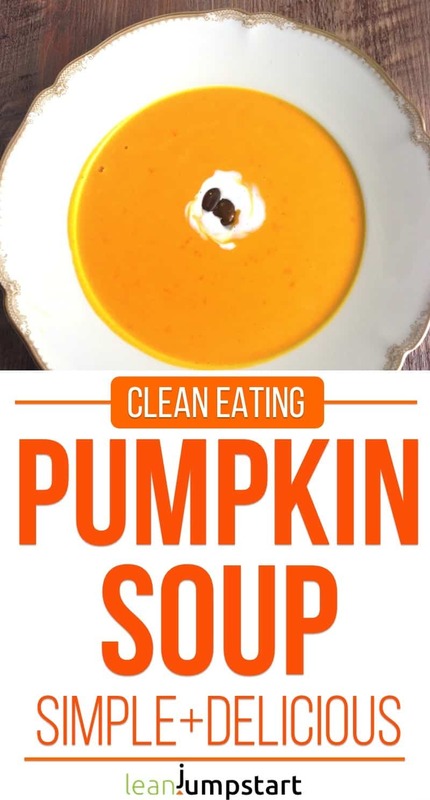 If however you want the pumpkin soup to be creamier and richer you can increase the amount of heavy cream while decreasing the amount of milk at the same time. If you need a vegan version you can use coconut milk instead of milk and cream. 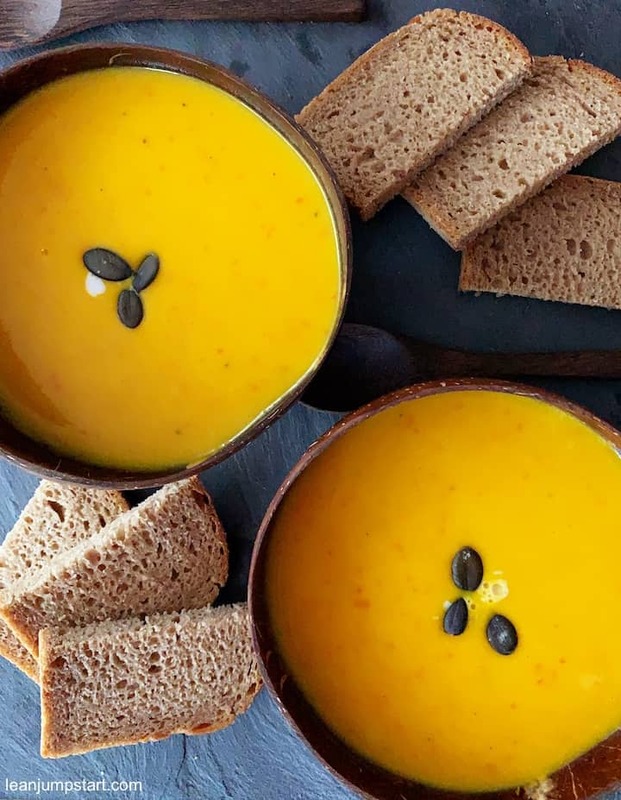 Butternut squash is a great Hokkaido pumpkin substitute for this autumn soup recipe. But I feel the one pot meal still tastes much better with red kuri squash. Let me know what you think in the comment section below. Hokkaido pumpkin is a typical winter squash that I get often delivered in my vegetable subscription box from October till March. After several rounds of fall soup meals For variation I sometimes cook the squash as wedges on a baking sheet in the oven. For the wedges I use the same marinade (some olive oil with rosemary) as I would use for (sweet) potato wedges. So, if you don’t have to peel it, you mean that you cube, cook, and eat the squash with the skin on? Just want to make sure I am not missing something, as I have never used this kind of squash before! yes, it’s true, you cube, cook and eat the red kuri squash with the skin on:) If you look closely at the soup photo above you will see orange dots in the soup. That’s the pureed skin which gives the soup a bit of a thicker texture. 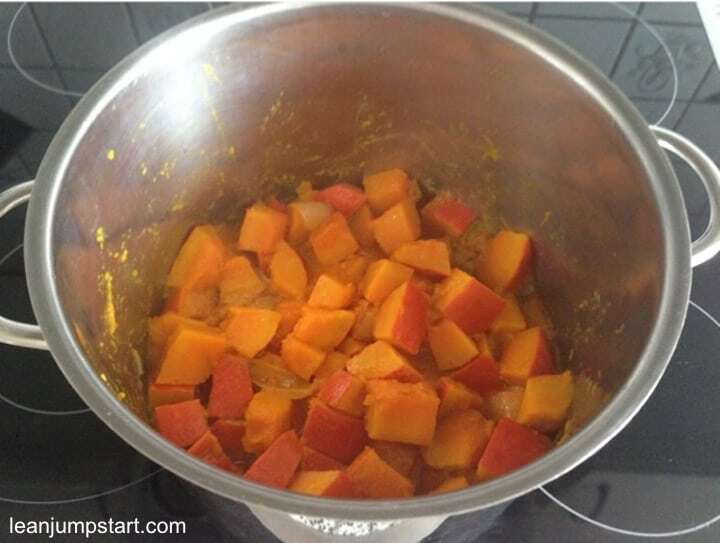 Just make sure to get red kuri squash/Hokkaido pumpkin as it won’t work with other squashes. Enjoy and let me know how you liked the soup. Sounds great. Thanks for sharing. The ginger makes it extra healthy. People on vegan diet can add coconut, almond or other non dairy milk and cream. No problems. Will taste just as good.